The 2018 National Premier Soccer League season certainly was a memorable one for Cosmos B, even if the team did not win the championship. The squad finished the year at 12-1-1, losing only to FC Motown, 3-2, in the Northeast Region Final. Cosmos B could not have asked for a better regular season. New York finished atop the North Atlantic Conference with a perfect 10-0-0 record, leading the 11-team conference from start to finish. The team outscored its foes, 40-8, and finished second in the NPSL power rankings among 98 teams. Rafa Garcia scores a goal just about every time there is a lunar eclipse. Recording a brace? It never happened until May 15, when he found the net twice in a 2-1 victory over the rival Brooklyn Italians. His first goal was a "mundane" one from the top of the penalty arc. His second score was one for the ages. Only a minute after Brooklyn equalized on Matthew McDonnell's goal, the veteran midfielder sent a 55-yard shot into the Italians goal in the 82nd minute at Hofstra Soccer Stadium. The win helped Cosmos B to avenge a 3-2 defeat to Brooklyn in a Lamar Hunt U.S. Open Cup play-in match on May 6. Bledi Bardic established himself as one of the NPSL's premier strikers, scoring at a goal-a-game pace. He finished with a team-high 10 goals -- including a hat-trick in a 4-0 win over Kingston Stockade FC on July 7 -- during the regular season before tallying twice in the team's first playoff game, a 4-2 North Atlantic Conference win over the defending champion Elm City Express. That victory came at a great cost to Bardic and the team as he suffered a hamstring injury that sidelined the prolific forward for the rest of the playoffs. 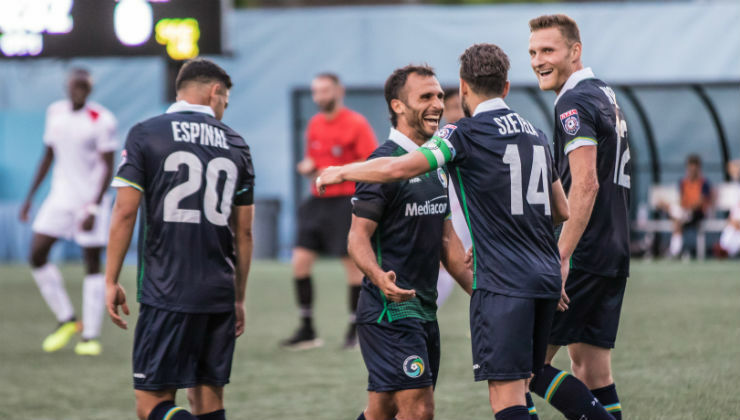 While it seemed inevitable that Cosmos B would qualify for the playoffs, it didn't become official until it defeated the Express on June 24 as the team also clinched the North Atlantic Conference crown behind a 5-0 victory. Bardic had a brace and Wojciech Wojcik, Darwin Espinal, and Danny Szetela each added a goal. 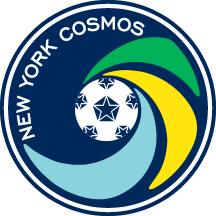 Trailing the Brooklyn Italians by a goal, Cosmos B pulled off a stirring comeback in the North Atlantic Conference final. Zaire Bartley tallied the equalizer in the 75th minute for a 1-1 tie. After 120 minutes, he added a goal in the shootout. Jonathan Borrajo connected for the game-winning penalty kick in the tie-breaker as goalkeeper Kevin Tenjo made an important save in the shootout, which Cosmos B won, 5-3. Against the Express in the North Atlantic Conference final on July 11, Cosmos B and the defending champions took a 2-2 tie into extra time at the Hofstra Soccer Stadium. Despite losing Bardic (a brace in the match) to a hamstring injury, the hosts took over in the two 15-minute periods as Wojcik and Bartley each scored to keep the team's perfect record in a 4-2 victory. While Cosmos B recorded 12 wins -- 10 during the regular season and two in the playoffs, you have to start somewhere. The squad certainly got off on the right foot on April 29, registering a 4-0 victory at Boston City FC. Espinal started his fine season with a brace as Alejandro Penzini and Szetela added goals. After scoring once off the bench during the regular season, Bartley might not have been the leading candidate to become the playoff surprise. But the Bronx-born forward rose to the occasion and then some, scoring four times in as many matches in the postseason. He certainly gave the club a big lift, tallying the insurance goal in the 4-2 win over the Express in the conference semifinals, a goal against the Brooklyn Italians in the final and two in the 2-0 win over FC Frederick in the Northeast Region Semifinals on July 18. Carlos Mendes could not have asked for a better start to his coaching career. He directed the team to a 10-0-0 record-season mark while the team went 2-1-1 in the playoffs. Mendes captained the Cosmos for five seasons after their return to competitive soccer in 2013 through the 2017 season. Mendes' success did not go unnoticed as he was named the top coach in the conference, region, and ultimately the entire league. If one player embodied the spirit of the Cosmos, it had to be Szetela, the team captain who was the soul of the team and among the hardest workers. Besides running the show, the veteran midfielder demonstrated how adept he was at converting penalty kicks, making it look so easy. He also was named to the North Atlantic XI along with Borrajo and Bardic, the latter two also earning Northeast Region honors.